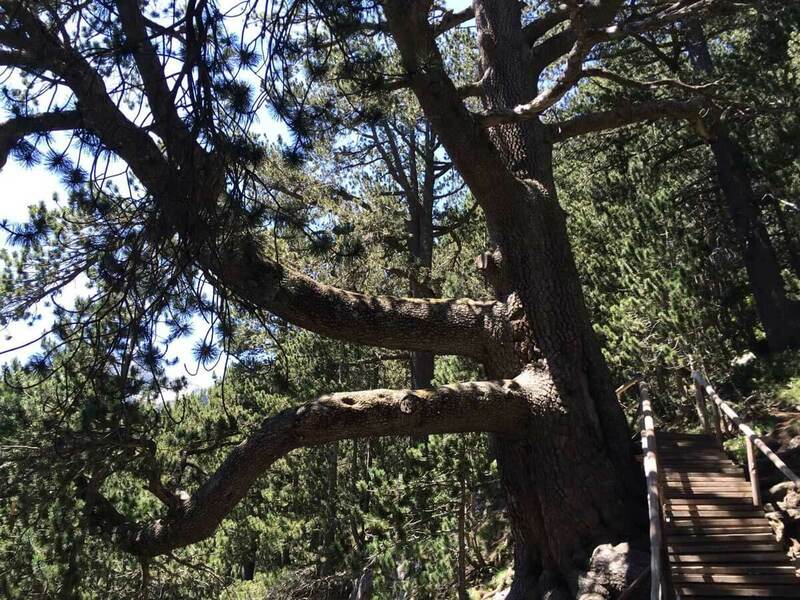 If you search the Internet for information for Baikushev’s pine, you will find out that it is a Bosnian pine and is the oldest coniferous tree in Bulgaria. 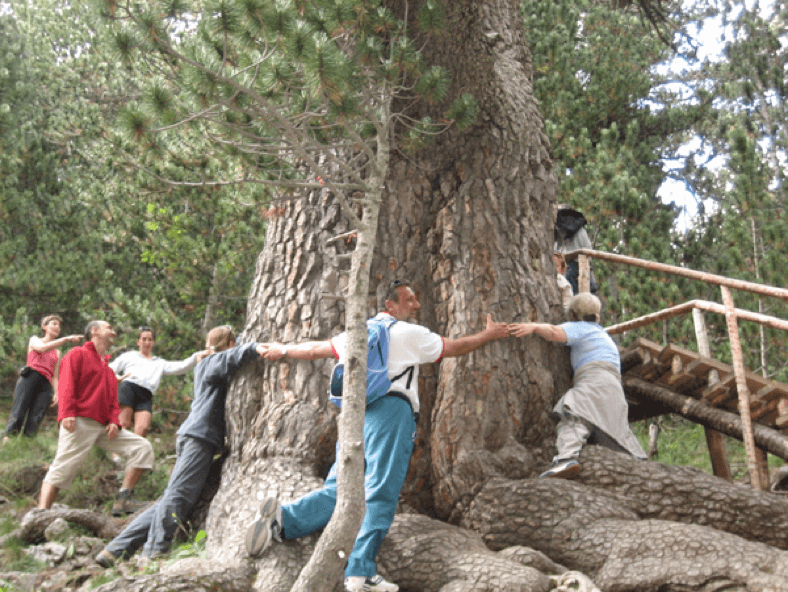 You will also find that the tree is 1300 years old and is located in Pirin, about 10–15 km from the town of Bansko. If this information suffices, you can stop reading, but if you want to learn a bit more about the history of the century-old tree, then keep on reading. Why is this ancient Bosnian pine known as this? Not many people know that Baikushev’s Pine is named after the man who discovered it – Konstantin Baikushev by Yonko Vaptsarov – the father of Nikola Vaptsarov. 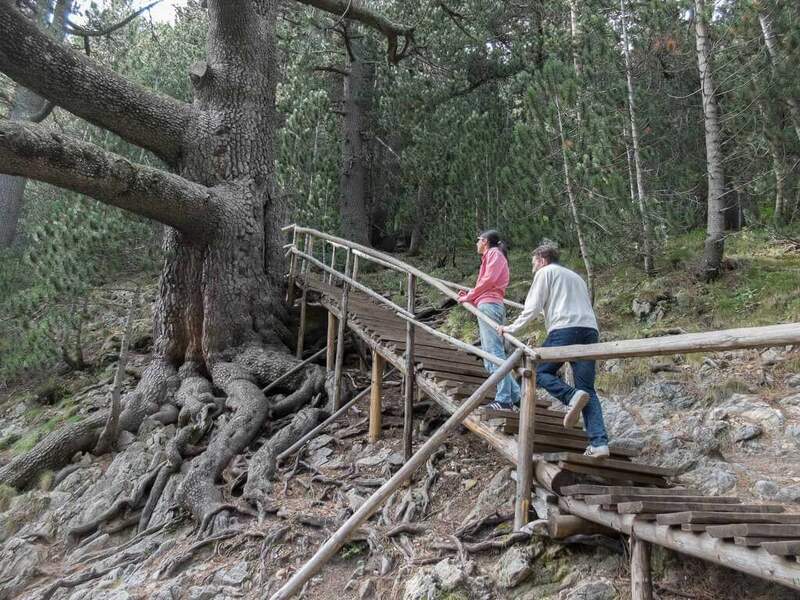 How was the centuries-old tree discovered? The story begins with Konstantin Baikushev who studied forestry first in the Czech Republic, and then graduated from the Forestry Academy in Tarrant (near Dresden). After completing his training, the young forester returned to the country with a lot of knowledge and thirst for exploring the native forests, and the first thing he did was to seek help from Prince Ferdinand to help him organize an expedition to study the tree species that grow on the territory of Bulgaria. Until this moment, no botanist had shown such a desire to explore tree species, so Prince Ferdinand took Baikushev’s request to heart, and in 1897 he ordered the expedition to be formed and the study to take place in the area of Pirin, Aton and Pelister. It is very honorable of Prince Ferdinand to order this kind of study of forests, since at that time the area was still under Ottoman rule and to undertake such an expedition required to ask for permission from the Sublime Porte. Thankfully, such a permission was given and Baikushev lead his expedition to the forests of Pirin. And right there, at 1930 meters above sea level, the forester found the tree. It stood there, proudly spreading its branches, with roots firmly rooted in the ground – a mute witness of the creation, ups and downs and resurrections of the Bulgarian state. Do you think that after discovering the centuries-old Bosnian pine, the work of Konstantin Baikushev was over? No, he was just getting started and that is why he wasted no time and started measuring and analyzing the exact age of the tree. Measurements revealed that the tree’s height was 26 meters, it had a thickness of 2.6 meters and a circumference of 7.6 meters. To determine the age of the pine, Konstantin Baikushev used a special tool called Pressler borer. With the help of this high-tech for its time widget, a wooden ring was extracted from the pine and its radius was used to count the years – 1200 up to 1897. As we mentioned above, the pine was named by Yonko Vaptsarov, who was the leader of several of the expeditions that Baikushev conducted in Pirin until 1915. Whenever Nikola Vaptsarov’s father lead a group in the mountains, he set the camps near the Bosnian pine and told everyone, “We set camp near Baikushev’s pine” or “We will rest near Baikushev’s tree”. So, slowly, everyone began calling the tree with the name of his discoverer, and today it is known as Baikushev’s pine. Banderitsa refuge is located about 300 m away from the natural landmark and a in the next lines we will provide useful information on how to get there quickly and easily, but now we would just like to tell you an interesting fact about it, and it is that the Banderitsa refuge known to all tourists today was actually built by Konstantin Baikushev and its purpose was to dry out seed from the Bosnian pine. The pine is a coniferous evergreen tree that belongs to the family Pinaceae. Trees of this species grow at 1,000–1,200 meters above sea level, and the two main species of Macedonian and Bosnian pine are found throughout Europe. The Macedonian pine in our country is mainly found in Rila and Pirin, and Bosnian pine is characteristic of Pirin and the border mountain Slavyanka. The Bosnian pine (like Baikushev’s pine) has a heavier and harder wood than the Macedonian pine and in the past its wood has been used to make ships, barrels, construction beams and others. Interestingly, pine is among the few types of trees that survived the global glaciation millions of years ago. Today, larger woods of Macedonian and Bosnian pine are found in Southeast Europe, mainly in Pirin and more limited in the mountains of Albania, Macedonia, Greece and Montenegro. Bosnian pine grows on mountain slopes, where there is almost no soil which somewhat explains how it manages to overcome the competition of other tree species. The tree also grows very slowly, forming a single ring for a year. This allows experts, after sampling, to determine not only the age of the tree but also to analyze the impact of the climate during the years in which the tree grew. Thanks to its clearly expressed annual rings, Baikushev’s pine “told” botanists and foresters how old it was and what the winters and summers were when it grew up. We told the story, presented the facts, but what about the legend? Many years ago, beyond the sea was Great Bulgaria. It was a rich, peaceful and happy country where everyone enjoyed prosperity. The capital of Great Bulgaria (Phanagoria) was a center for merchants, scientists, poets, artists and gardeners. One of the most beautiful things in Phanagoria were its gardens, and Khan Kubrat, who was the ruler of Great Bulgaria, loved most to rest and ponder under the shadow of Bosnian pine branches. Day after day, Kubrat enjoyed the growth of the tree, and it seemed as though the tree felt the ruler’s love and became more and more beautiful. The more and more prosperous Greater Bulgaria became, however, the more it was perceived as threat by other countries, which increasingly began to attack it. Hard times began for Great Bulgaria and to protect his people, shortly before he died Khan Kubrat ordered his sons to split and go around the world looking for a better place to live. And so, it happened. The sons buried their father in their home Phanagoria, planted seeds of his favorite Bosnian pine on his grave, and set off on their way to find a new home for their people. The land of Bulgaria became desolate. The homes, the markets, the gardens were all torn down. Only the faithful gardener of the khan stayed in Phanagoria, going to his grave every day to “have a talk”. One-day sorrow was so heavy in the heart of the gardener Baikush, and he finally decided to follow his son who had gone with Asparukh to the lands beyond the Danube. Before he set out, however, he decided to go visit the khan’s grave one last time to say goodbye. As he stood beside the grave and his heart was filled with grief, Baikush heard Kubrat’s voice telling him to take the seeds of the Bosnian pine and bring them to Asparukh to plant them on the new land. “As long the Bosnian pine stands, there will be Bulgaria“ – said the khan to the gardener. After many difficulties along the way, Baikush finally arrive on the new Bulgarian land but could not see his son who had died in battle. Broken, Baikush asked Asparukh to point him to the place where his son died and immediately headed over there. The grieving father found his son ‘s grave, wept for his child, and decided to stay near him. He could not take the Bosnian pine seeds to Asparukh, so he decided to plant them on the grave of his son and take care of the tree while he was alive. Baikush took care of khan Kubrat’s favorite tree for many years, and when death took him, the wood “hid” the tree from strange eyes. The tree grew as the state grew. Sometimes there were bad years, avalanches, fires raged, but Baikushev’s pine withstood everything, because as Khan Kubrat said: “As long as the Bosnian pine stands, there will be Bulgaria. Baikushev’s pine is about 10–15 km away from the town of Bansko and about 300 m from the Banderitsa refuge. You can reach the natural landmark in several ways – on foot, by bicycle, by car or by bus. If you are a guest at the Lucky Bansko Hotel and have decided to get to Baikushev’s pine by car, it will take you about 30 minutes (15.1 km). The only thing to do while leaving the hotel is to take Pirin Street to exit the city. Continue driving straight and follow the signs to get to Banderitsa refuge. Continue about 400 meters along the road after the hut and turn right to the established parking lot. There’s no way to miss the tree as it is visible from the main road. There are wooden stairs and a fenced area next to Baikushev’s pine revealing wonderful views. 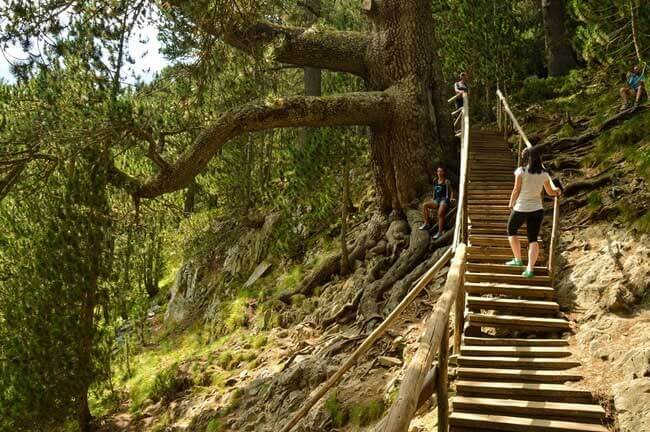 If you choose to have a summer hike with a picnic, you will need about three hours and 30 minutes (12.6 km) to get from Lucky Bansko to Baykushev’s pine on foot. From Bansko, there are also buses that can take you directly to Banderitsa refuge and Baikushev’s pine.